The Hudson Highlands are mountains on both sides of the Hudson River in the U.S. state of New York, between Newburgh Bay and Haverstraw Bay, which form the northern region of the New York - New Jersey Highlands. The Hudson River enters this region in the south at Dunderberg Mountain near Stony Point, and from the north in the vicinity of Breakneck Ridge and Storm King Mountain near Cornwall, New York. These highlands played a significant role in America's military, cultural and environmental history. The bedrock of the Highlands is part of the Reading Prong and more than a billion years old, formed during the Grenville Orogeny. It represents the very core of the Appalachian range, which has been formed by successive mountain-building events (orogenies). The present mountains have been exposed by the process of isostasy through the late Cenozoic Era. The hills were given their rounded form when glaciers cut through the Appalachian Mountains here, the Highlands are among the lowest summits in that range (indeed, the Appalachian Trail reaches its lowest elevation in the Trailside Zoo between Bear Mountain State Park and Bear Mountain Bridge). Conversely, the river becomes narrower and deeper through the Highlands, reaching its deepest point of 216 feet (66 m), near Garrison. Many stretches are challenging to navigate, earning nicknames like "World's End." Henry Hudson and his crew on the Half Moon were the first Europeans to see the Highlands when they explored the river in 1609. The mountains became strategically important during the Orange County, New York. 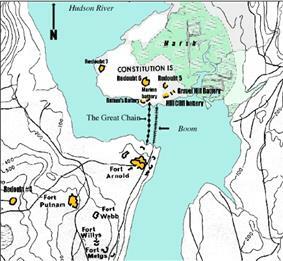 From 1778 to 1782, the chain was stretched across the river from the Fort Clinton at West Point. The site of the fort is today the eastern most point of the grounds of the United States Military Academy. Several decades after independence, Thomas Cole started an artistic movement by painting America's wild and rugged landscapes— especially, at first, the Highlands— with the stark contrasts and shadows they offered, in a way that suggested raw nature, a world reborn. After the movement had faded, a critic derisively referred to the movement as the Hudson River School; the name stuck as the label for the new nation's first homegrown artistic movement. In the early 20th century, in response to damage caused by quarrymen and loggers in the Highlands, local conservationists began to press for public ownership of the area's woods and mountains. Their efforts paid off in the first of several state parks that now blanket the chain. Later that century, an ambitious power-generating plan that would have dug into Storm King Mountain led to a landmark lawsuit by environmental groups that made history when the judge ruled that aesthetic impacts of such large projects could be considered and that a coalition of citizen groups had legal standing. This landmark lawsuit formed the basis for a large body of case law concerning environmentalism.